Send Paytm Wallet Money Bank Account: In This Guide, I will Tell you that send Paytm money to bank account Instantly. Most of you are already know about Paytm. In which you can recharge or shop online at lowest Price. 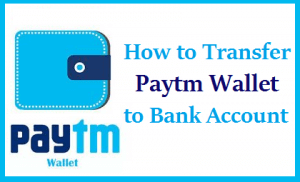 This is the very good feature by Paytm, in which you can Transfer your Paytm wallet money to your bank account instantly, without any delay. previously, i was also shared a guide about transfer paytm cash to another account. Paytm is Very old online shopping site, when you shop from Paytm, then you will get some cash back in your account, you can transfer that cash-back to bank account, checkout below guide for more details about this. Many of you are already know about, that how to Transfer Paytm cash or Cash back to bank account. but some of the users, don't know about this. so you can checkout this Complete Guide, on how can you send Paytm cash to bank account. 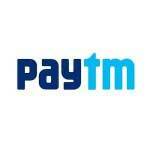 We have also shared Paytm Coupon Codes for Recharges or shop online. also, we was shared some Paytm Offers. So checkout more details about transfer Paytm cash to bank account & Follow below simple steps, with Screenshots for more easy Guide. Paytm is a well-known online shopping site, which you can use for recharge or shop online. you can recharge your mobile phone, from this site / app for get best products at lowest price & much more. It's very old & well-known site, trusted by many users. you can also Use Paytm for doing transactions like recharges, Bill payments, DTH Bill payments, shop online for mobile , sports, LCD etc & much more. This is the easy tutorial for send paytm money to bank account. There was some other methods, which you can use to send your Paytm money to bank account, but now, Paytm is upgraded, they only enabled Bank transfer feature in Mobile Phones, via Paytm wallet app. You can also send Paytm money to another accounts, via Paytm wallet app or do any other transactions etc. With this app, you can send money to another Paytm account, via his Mobile phone number or Gmail address, which he / she registered on Paytm. so checkout below full tutorial for get detailed guide on how can you send Paytm cash to another people's Paytm account. so checkout below full Guide for send paytm cash to bank account. These was the charges, for send your Paytm cash to your bank account. if you have big money in your paytm account, then you can upgrade your paytm account, then you have to pay only 1% charges for send money to bank account from your Paytm account. so if you want to update your Paytm account, then you have to give your documents to Paytm follow below simple guide, for Upgrade your paytm account now for send paytm money to bank account with 1% charges. Now, here you will see some options, just Click on Request Wallet Upgrade option from there. You will be able to see your address here, or enter your address. Now, Paytm team will come to your house, for pickup your documents. once, they will review your documents, then your wallet will be upgraded. Faq's for Send paytm money to bank account. A1) 1,000 rs is Minimum Amount, which you can send to your Bank account from Paytm. A3) Now, you have to Pay charges always, but you can upgrade your account, then you will be charge 1% for transfer Paytm money to bank. If you have any Other question , then feel free to comment below. i will answer it asap. After enter OTP Code, now it will login your Account, Now Goto Send option & you will see paytm bank transfer option, Tick on Bank A/C option, like screenshot below. Now, Enter your Bank details, In the Form & minimum Amount for transfer is 1,000 rs. after enter all details, click on send money option. 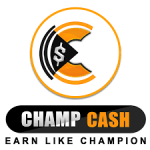 It will Send Money in your Bank account Instantly ! Hurray you are done ! I redeemed 1906 rs – 4% Tax = 1830 rs in Bank Account. If you are shopping from paytm, then if you apply some coupon codes, then you will get some cash back amount in your Paytm account. So, if you Got some type of refund in your account, or you have got cash back in your account, then what can you do in this case. you can send your Money to your Bank account Instantly. You don't need to wait for send money to your bank account from your bank account. it will transfer money to your bank account in one second. So follow each & every step carefully, you will be able to send Your Paytm cash to bank account without any issues. so check it out. Paytm customer care are available, for any kind of help regarding Paytm. for example, if you have transferred money to bank account, due to some technical issues, your money is not credited into your bank account. then what can you do in this case. you can directly contact Paytm care, for any kind of issues like recharge fail , cash back not received, or any kind of issues etc. there are 2 ways, in which you can contact Paytm. 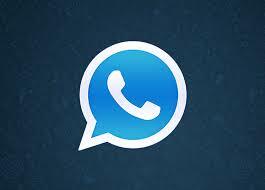 first one is that, you can simply send an Email to paytm, just click on link below. or you can contact paytm by contact us form, which is given below. if there is any delay while send your money to Bank account from Paytm, or your Paytm money to bank transfer failed, then you can also contact paytm regarding this. they will surely help you out in this matter. If you want to send your paytm money to bank account, via PC then you can simply follow below steps. it will surely work for you without any issues. This method will work in Paytm site, which you can checkout from below. 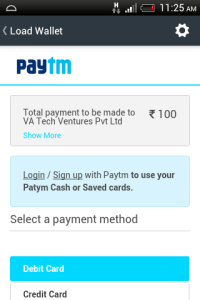 Now, Select Paytm wallet option from there. You will get money in your bank account under 10 minutes, contact Paytm for any kind of issues. So guys, this was a way, to send Paytm cash to bank account via your PC. This is the very good offer By paytm, which you cam use to send your Paytm cash to bank account. you can simply open Paytm from your Pc, for sending your money to bank account. you just have to enter your Details, like Name, Bank number, Bank IFSC Code etc. 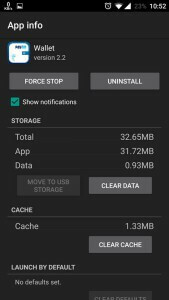 At first, Install Happay app from Google Play Store in your phone. Then, Click on add money option simply & enter amount of your choice. Now, it will add money to your Paytm account successfully. Now select Withdraw option & Send Money to your bank account easily. So guys, this was th from one of the easiest method for send your Paytm money to bank account. With the Happay app. It will send your cash cashback or paytm cash to bank account very easily. i hope you have liked this method. For send your Paytm cash to your bank account, you also need IFSC Code of your bank account. 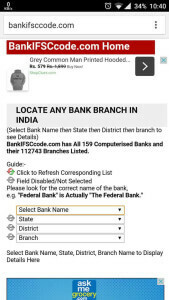 so, you can follow below simple guide, for find IFSC code of your Bank Account. Now, Enter your bank details, one by one & select your bank branch. it will show you your bank's IFSC code, or you can also see your bank copy's first page. you will see IFSC code there. Now, you have IFSC Code of your bank account. now you can send your Paytm wallet money to your bank account without any issues. checkout terms & conditions for send Paytm cash to bank account from below. User's Mobile Number & Email Should be verified from Paytm. User will be charged 4% For Send Money To Bank account. Paytm cash will be sent to bank account instantly. for any kind of issues, contact Paytm. Paytm Transfer To Bank option will work only in Paytm wallet app, which is available for Mobile Phones. So guys, these was the terms & conditions, which you must read before transfer your Paytm money to bank account. you must try out this feature, if you have some extra money in your bank account. you can send it to bank account instantly. this is the great news & very good feature, which is launched By Paytm recently. 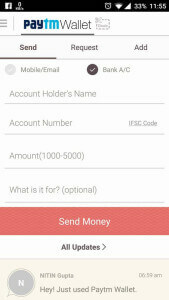 Freecharge also have bank transfer feature now. So now, competition is high between all sites, so they are trying to provide best suitable services for their users. paytm bank transfer not working? So Guys, this was the easiest method for send paytm money to bank account, previously we was shared a guide about how to transfer freecharge credits to bank account. In this guide, if you have any confusion / questions, or you want to give any Suggestions, then feel free to comment below. Keep visit here for get more guides like this, Thanks for Visiting ! Dear admin mere. Dusre mobile I’d paytm pe me bina otp sath old paytm pe login karke bill ya recharge krna ja raha hu to show error ki upgarde paytm . 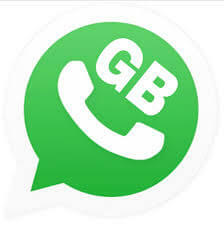 pls help me gake mobile no sim mene use krke throw kar chuka hu. maine ebay se aaj ek ordar kiya aur paytm se pay kiya and baki ka amount netbanking se paytm me dala ab saler ne ordar cancel karke refund aprobe kiya hai to muje sub amount paytm me hai milega ya bank se pay kiya hua bank me milega ? Bro how much time does it takes to get money transfered to bank? I want to know how much maximum amount can i transfer in any bank account via paytm wallet after up gradation of wallet. Dear admin I used the payment app to transfer money from my wallet to bank account on Aug 16th but it is still pending. Is there a minimum time delay for bank transfer? What If iItransfer cash from Credit card to Paytm.. And transfer it back to saving account? Will there be any charge? i have 10000 in my paytm account. can i transfer the whole money to bank account? how long does it take?